Restaurants have improved their healthy offerings for kids' menus, but parents aren't buying them, researchers say. Fast-food chains have promised to offer healthier kids' meals, and have made some changes. But the results of an online survey published Thursday suggest that most parents are still buying their kids french fries and soda with their meals instead of apple slices and low-fat milk. In a 2016 online survey, the Rudd Center for Food Policy and Obesity at the University of Connecticut asked 871 parents from diverse racial and economic backgrounds about their fast-food purchases. Ninety-one percent said they took their kids for at least one meal within the past week at one of the four largest fast-food chains — McDonald’s, Burger King, Wendy’s and Subway — up from 79 percent in a similar survey taken in 2010. Those four restaurants all made public commitments to offer healthier options for beverages and sides in kids’ meals, but the Rudd Center found that just 26 percent of parents reported buying meals with only healthy food for their children. The survey could not explain why such a low percentage of parents reported exclusively choosing healthy options, especially since it found that parents cited those options as a factor in choosing fast-food restaurants. The statistics from the survey indicate that parents are mostly buying meals with at least one unhealthy item for kids, and that overall, nearly all kids’ meal items exceed recommended levels of calories, saturated fat, sodium and sugar. Harris also said restaurants could do more to support parents. She cited a study from the Rudd Center released last month that found that online, the four restaurants had taken steps to add healthy options to kids' menus or remove unhealthy items entirely. However, when researchers visited restaurants, they found that one-third offered unhealthy options that were not listed online, and that some automatically provided a cup for a soda fountain drink instead of a healthy beverage. Healthier food for kids continues to be a topic of concern as childhood obesity increases. A study released in February found that 40 percent of 16- to 19-year-olds are obese, and 26 percent of 2- to 5-year-olds are overweight and more than 15 percent were obese. The Rudd Center report found that parents were more likely to choose healthier beverages than healthy snacks. Fifty-nine percent of parents who reported purchasing a kids’ meal got a healthy beverage instead of a sugary soda; that number rose to 66 percent for meals bought specifically for a younger child. However, 61 percent of parents reported purchasing an unhealthy snack. Hillary Caron, senior policy associate at the Center for Science in the Public Interest, an organization that advocates for a healthier food system, wasn't surprised by this disparity. She noted that McDonald's and Subway have made healthy beverages the default beverage for kids' meals. "Healthy options need to be the default," Caron said in an interview. "It helps support parents to make healthy choices for their kids. Since the Rudd Center conducted the study, Caron said, there's been some progress. 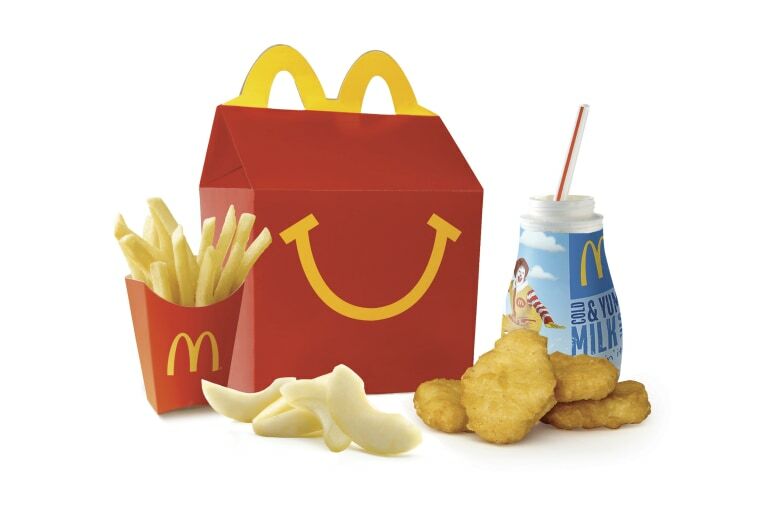 McDonald's announced in February that it was improving nutritional standards for its entire kids' meal, not just beverages and sides. This included taking the cheeseburger off the menu, and temporarily removing chocolate milk while it is reformulated to remove added sugar. On the legislative front, California passed a law last month requiring restaurants to make milk or water the default beverages for kids' meals. Caron said that despite these encouraging signs, there's still much to be done to ensure that kids are eating well. "We need to stop pushing what's the norm in this country, that soda and fries are the meal for kids," she said.